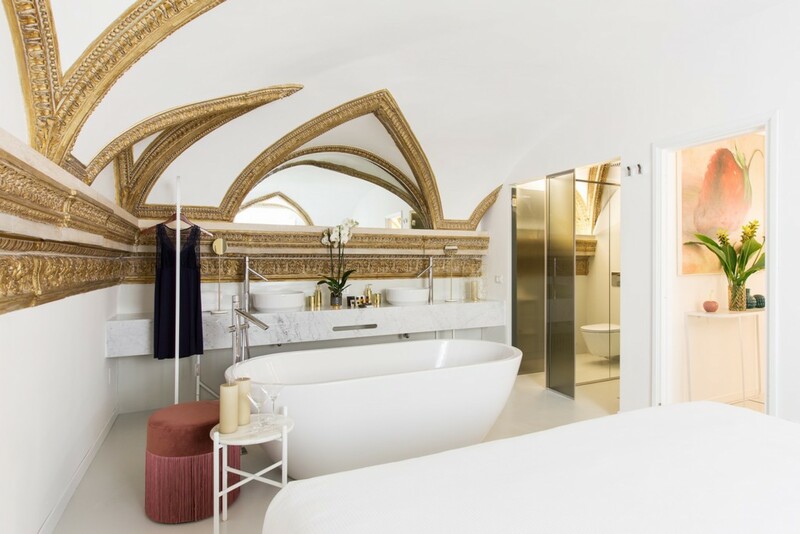 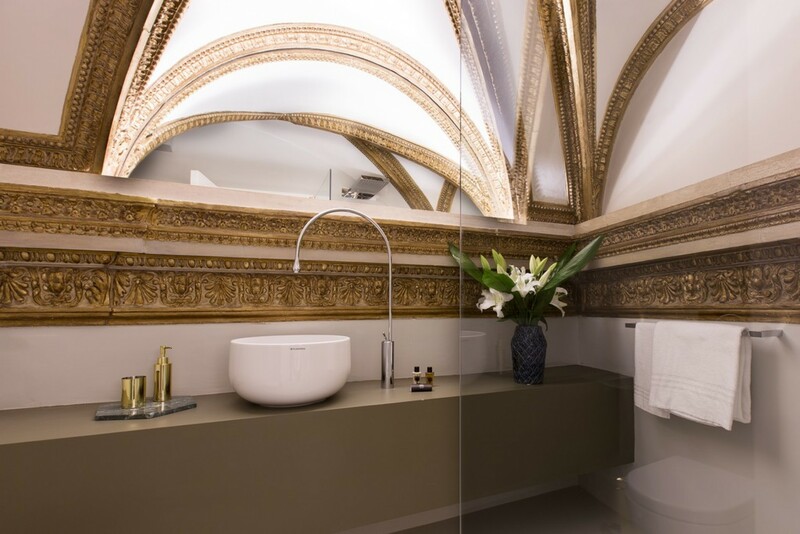 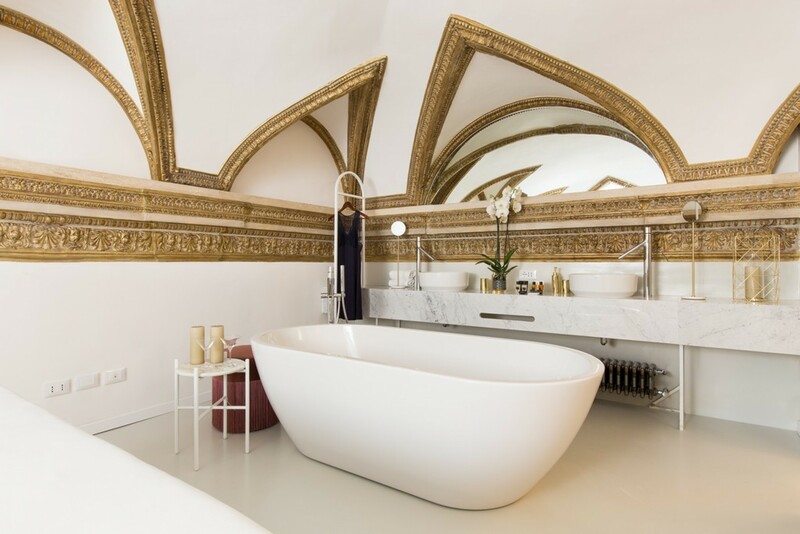 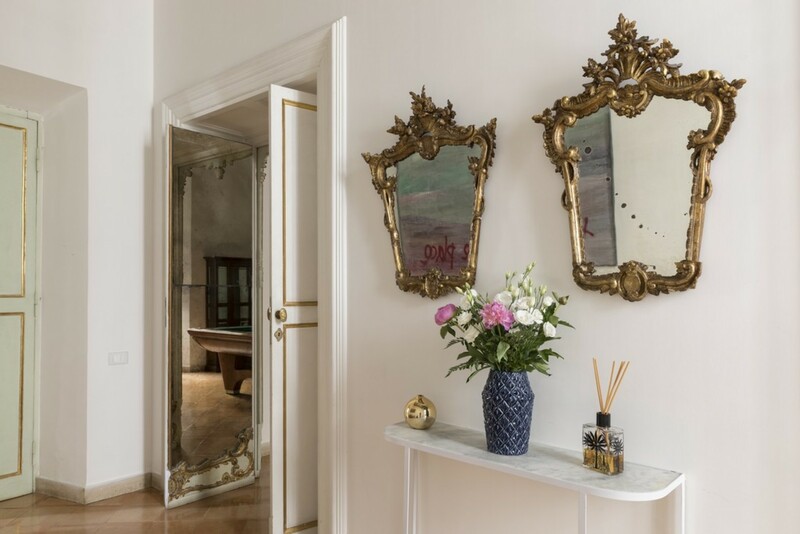 Welcome to the Costaguti Experience, a 5-bedroom luxurious apartment that is the epitome of distinguished Italian living, sitting at the centre of the Eternal City itself, Rome, Italy. 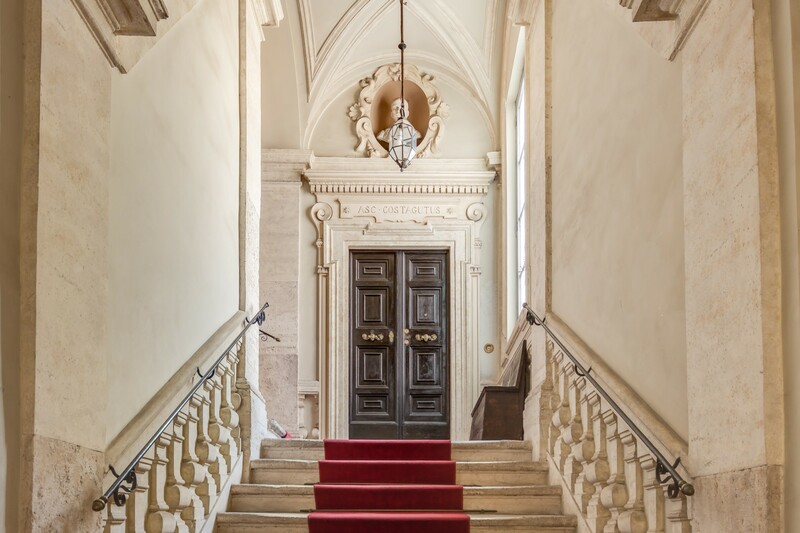 Originally built in the 16th century and still in ownership by the descendants of the Costaguti brothers who bought it, the architecture of Costaguti palace is of Renaissance style, featuring a piano nobile, or main noble floor, a place where honoured guests who were present would be entertained. 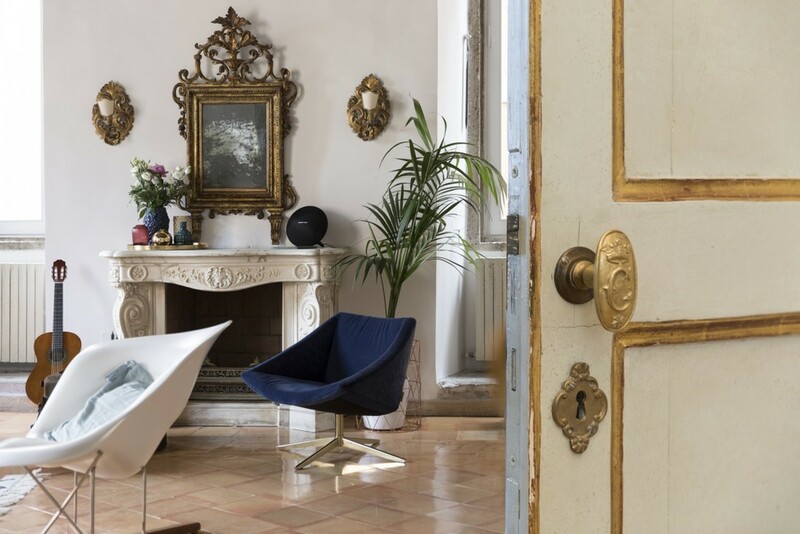 Upon entering from the marble staircase, and through the grand wooden double doors, a spacious lounge area welcomes guests into the space. 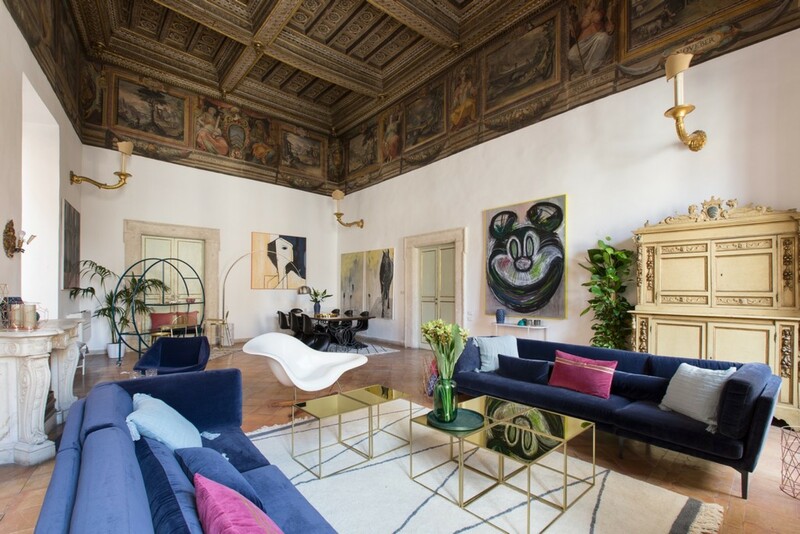 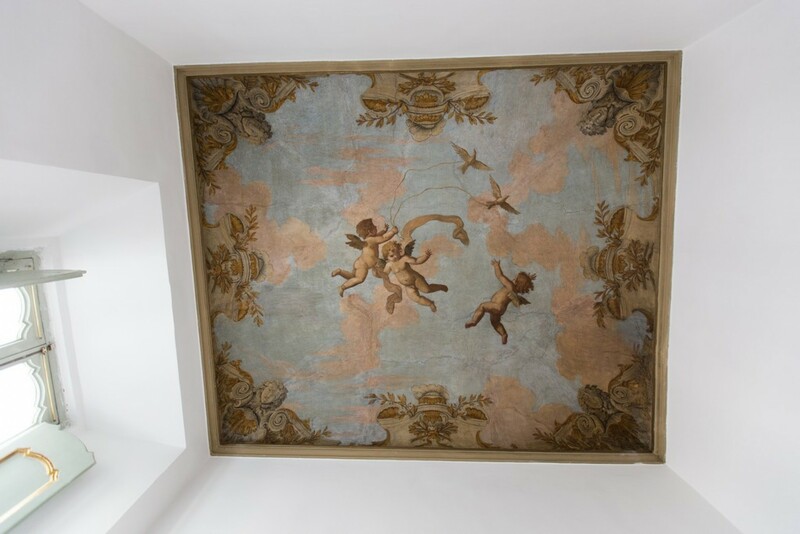 Showcasing a marvellous blend of Renaissance-era art and architecture with modern renovations and the conveniences of the 21st century, ceiling fresco paintings that stood the test of time from master painters such as Cavalier d’Arpino are still on display within. 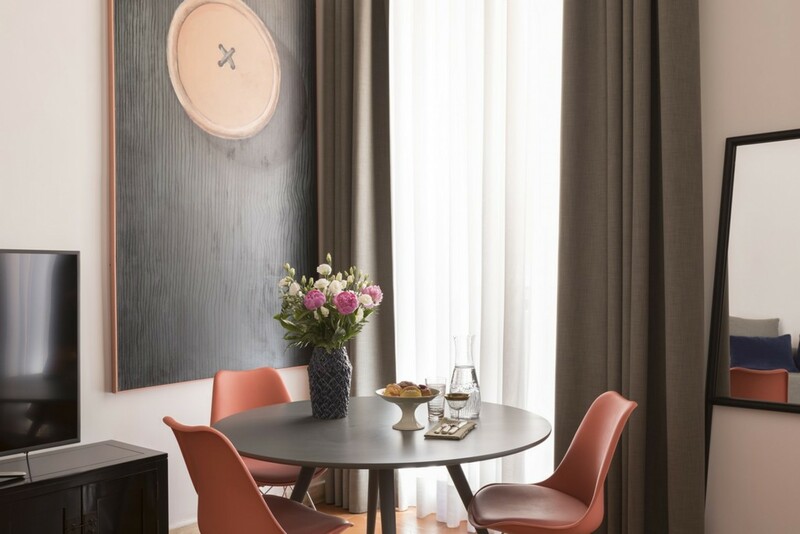 The décor of the lounge is decidedly modern against the archaic paintings – modern art pieces decorate the lower parts of the tall white walls, stately blue couches with plush cushions, ottomans and stylized tables and chairs populate the living area, and a dining table with intricate metalwork legs sits adjacent to the living area as part of an open plan. 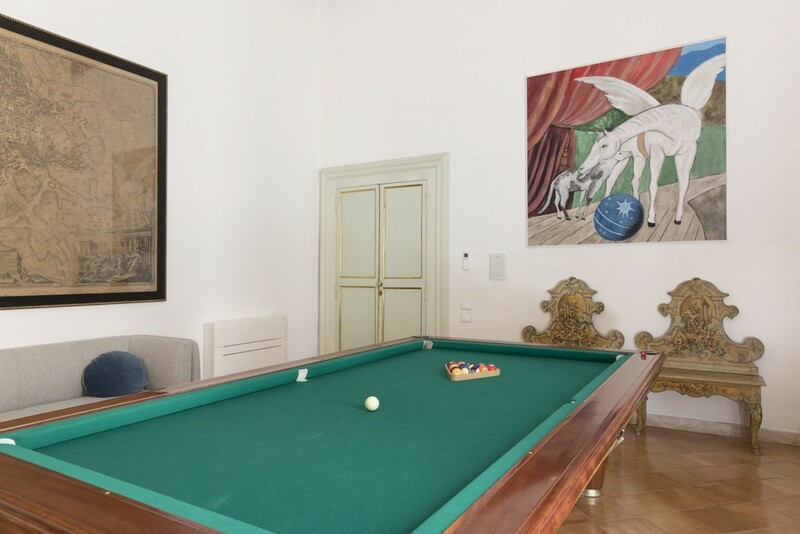 A billiards room is also available for the pleasure of the guests, a grand pool table dominating the floor. 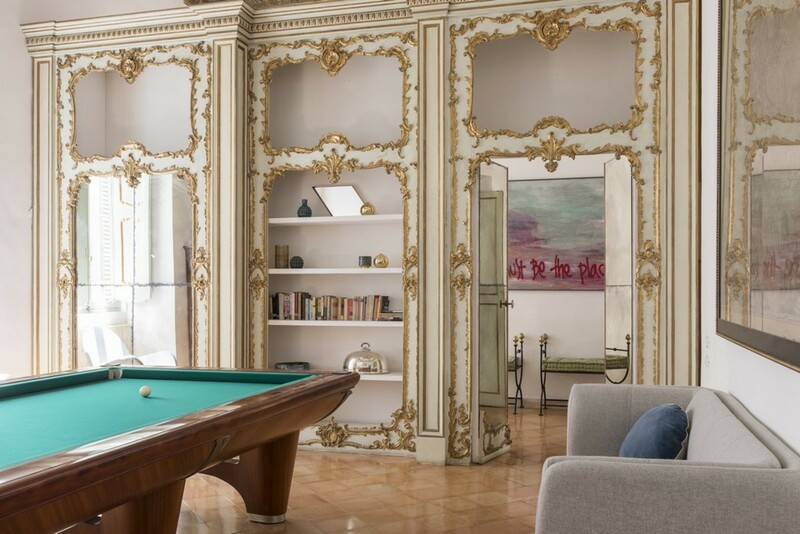 The tall walls are also accommodating an ornately gilded bookshelf, providing the opportunity to curl up and read for a while in the downtime moments. 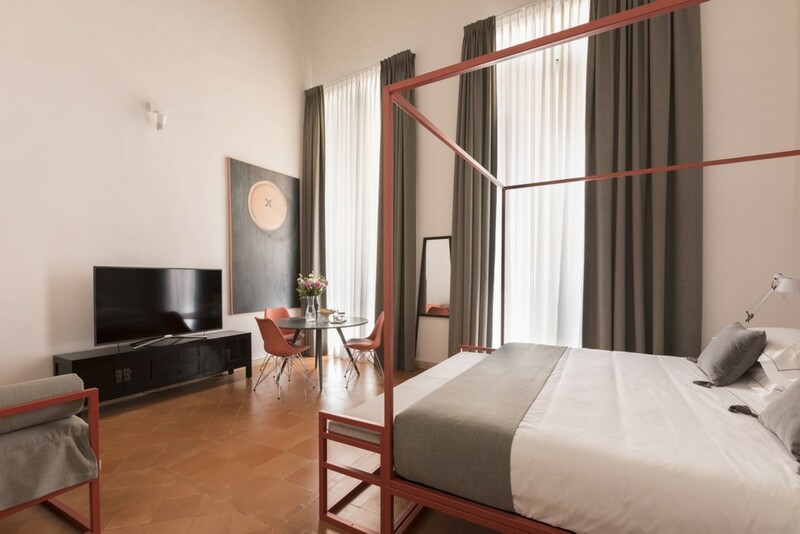 Alternatively, each room is equipped with a wide-screen 4K television with satellite TV, which makes for content and comfortable viewing within the warmth of the high-quality linens that dress each bed. 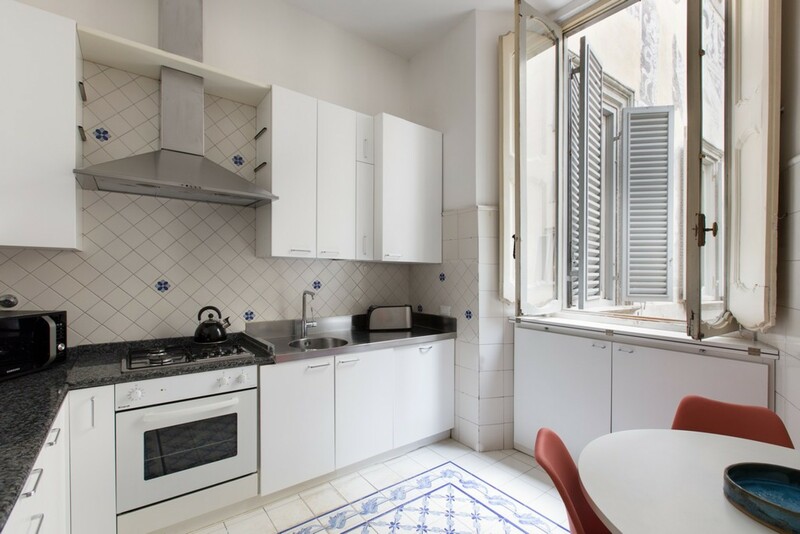 A fully equipped kitchen with state-of-the-art appliances, sleek cabinetry and charming tile work sits at the ready for guests to prepare and cook meals. 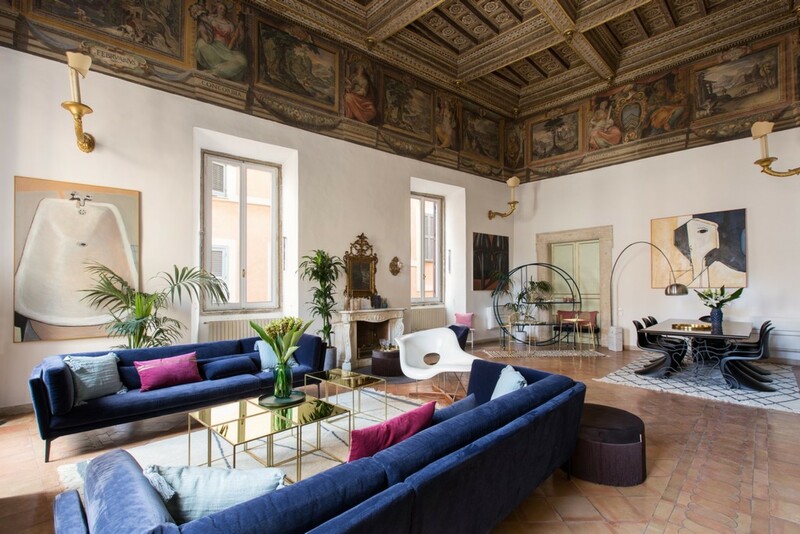 With the services of a personal chef, guests have the option to sit back and await mouth-watering fare, or join in with the work and learn how the professionals do it, using local produce to prepare for a sumptuous feast of Roman cuisine. 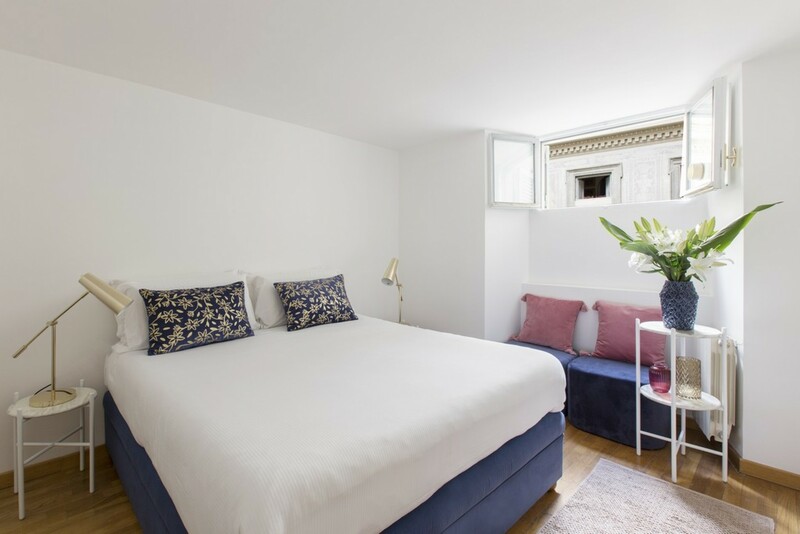 Modernised bedrooms contain luxurious four-poster beds to sink into after a long day of experiencing the wonders of the city. 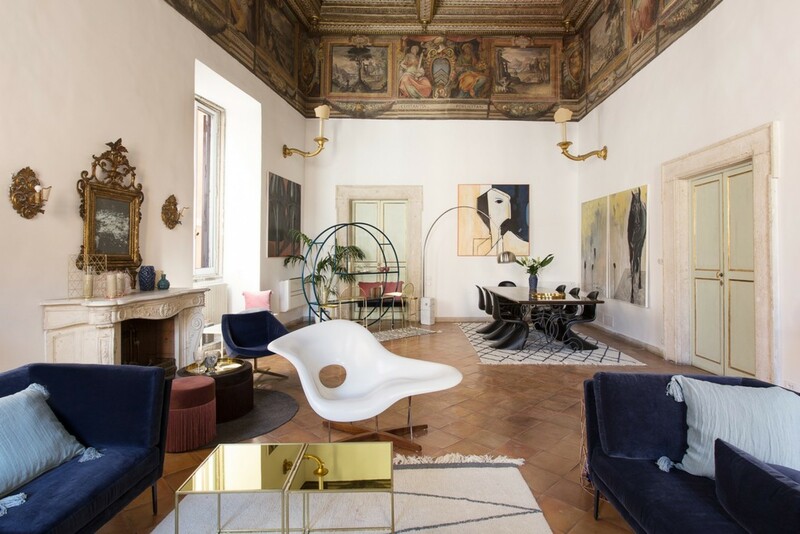 Tall walls and lofty ceilings accommodate towering windows, filling the rooms with fresh air and ample light as the day rolls on. 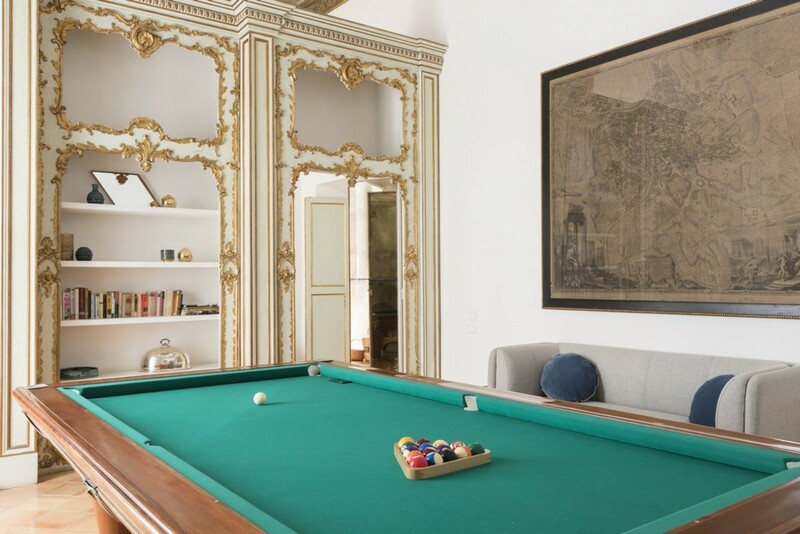 Following the same blended style as the rest of the building, modern and minimalist furniture is mixed with a blend of embellishments on the walls in several bedrooms, preserving the work of old masters. 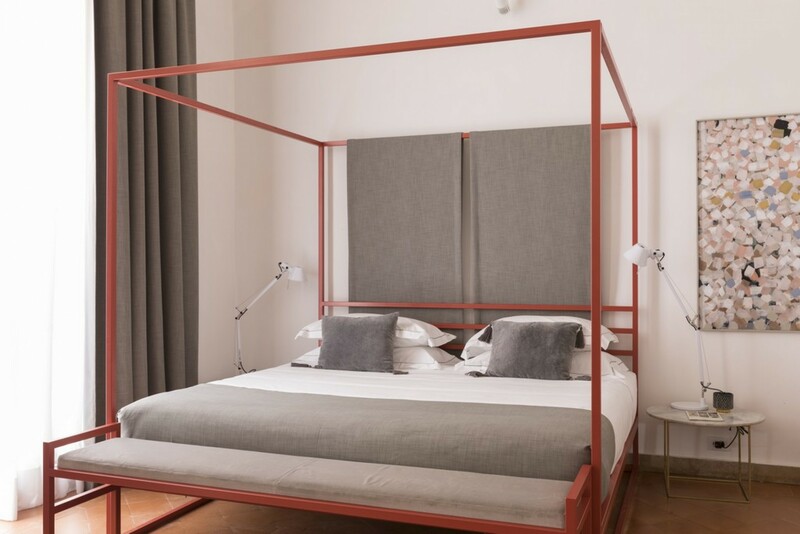 The bedrooms’ use of minimalist décor provides a space for the guests to relax and unwind, using gentle and warm colours to instil a sense of calm before sleep. 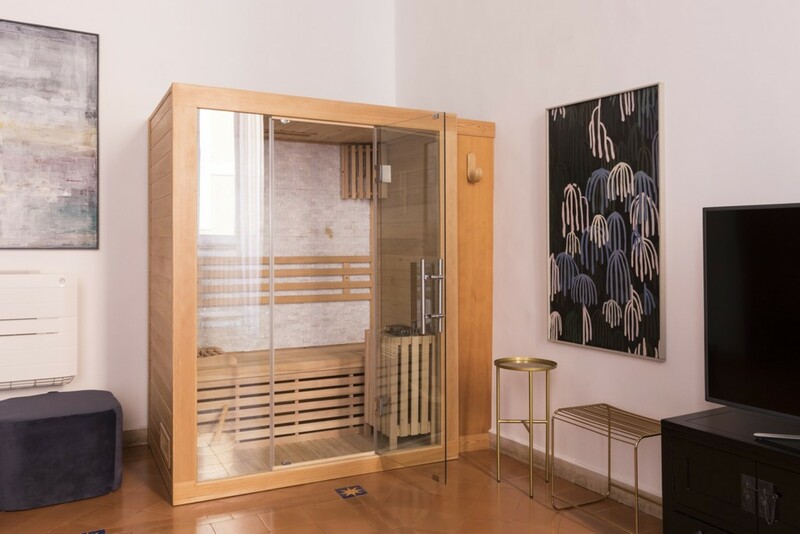 One such bedroom has at its disposal a private sauna that promotes the cleansing of the skin, relaxing of the muscles and helps to bring about a sense of well-being. 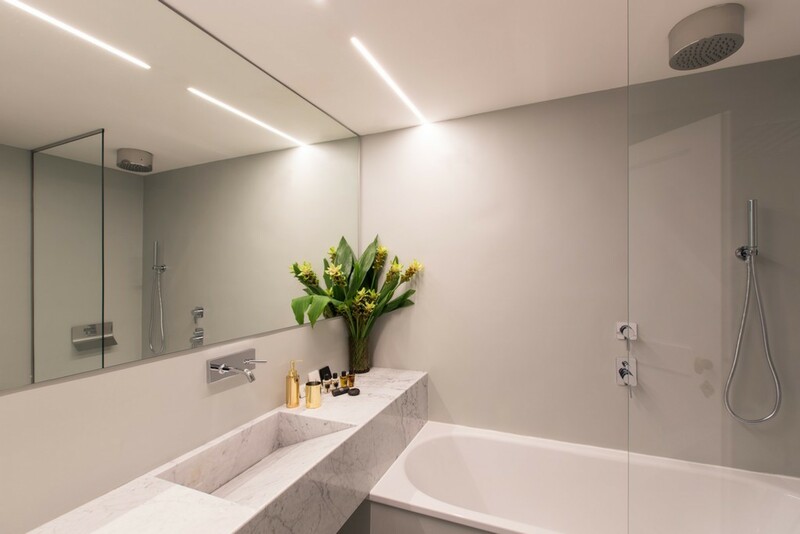 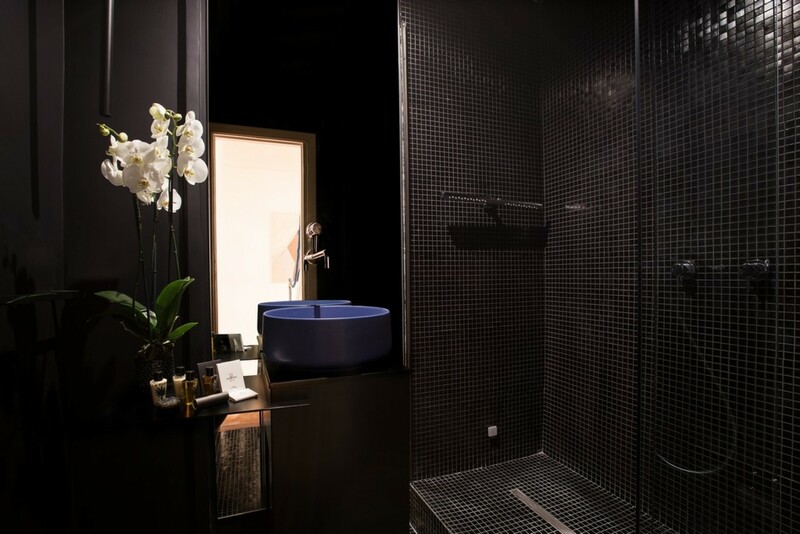 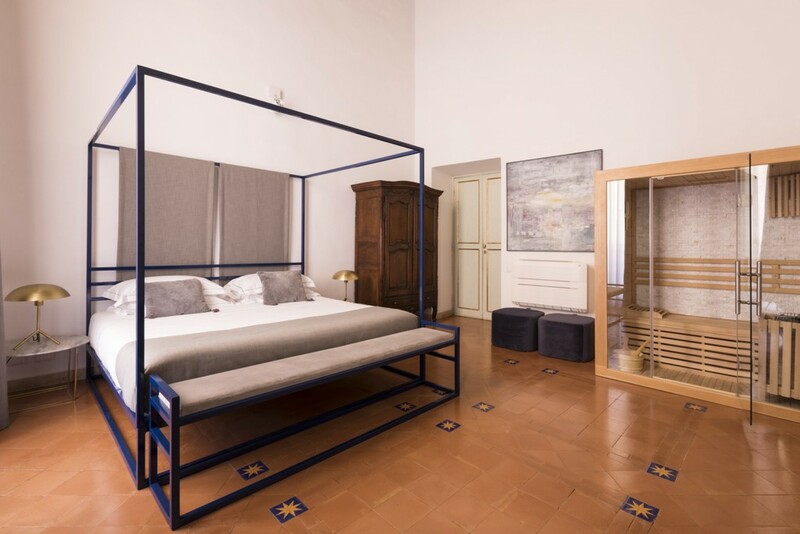 Each bedroom has been equipped with an en-suite bathroom, several of which contain a spacious bathtub that is perfect for unravelling tightness in the body after a long day of exploration and activities. 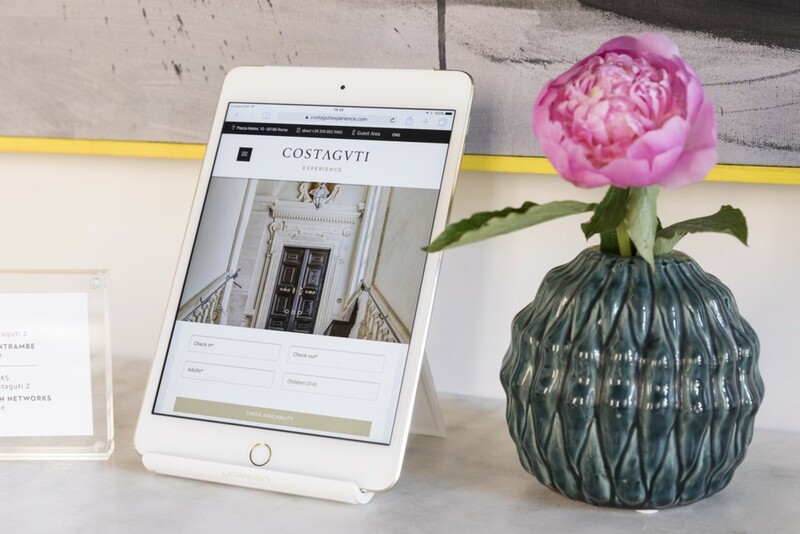 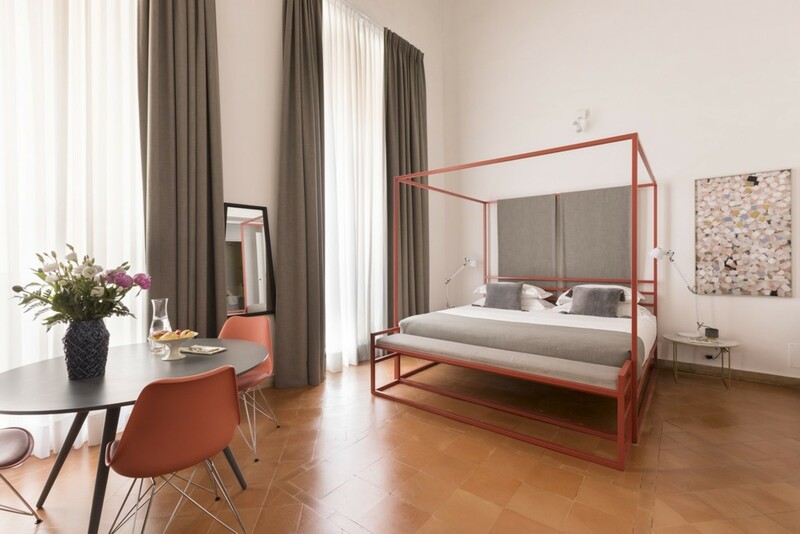 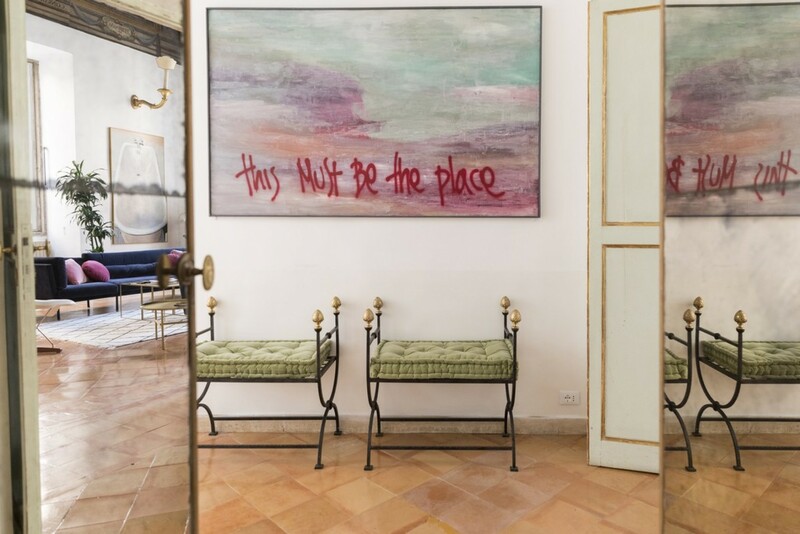 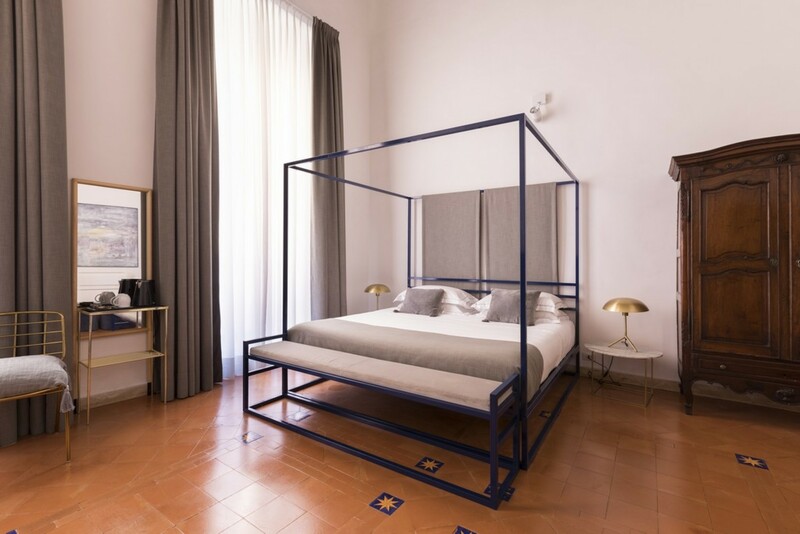 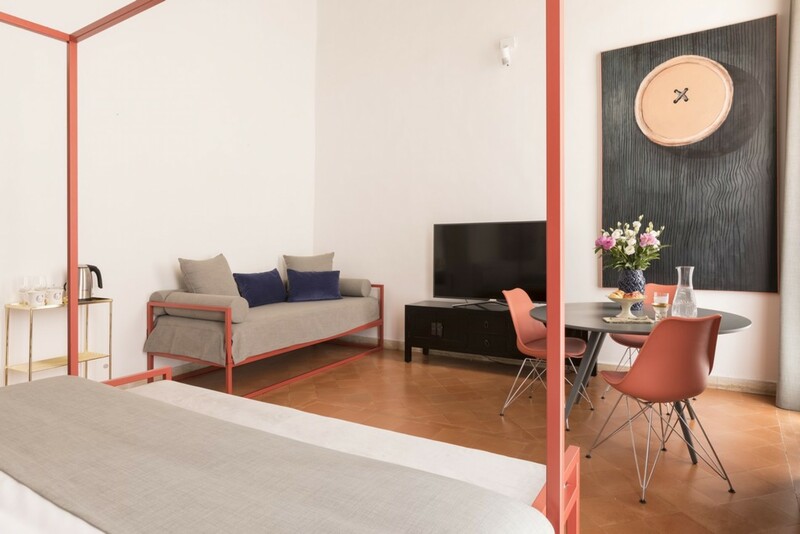 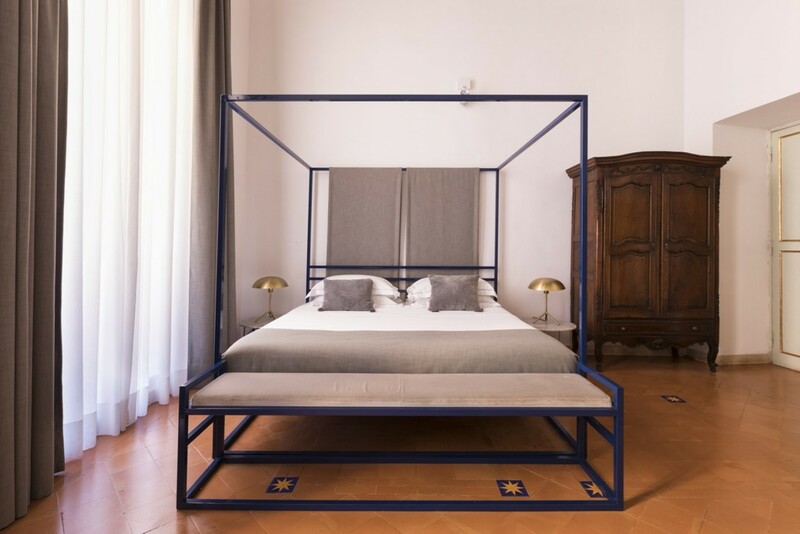 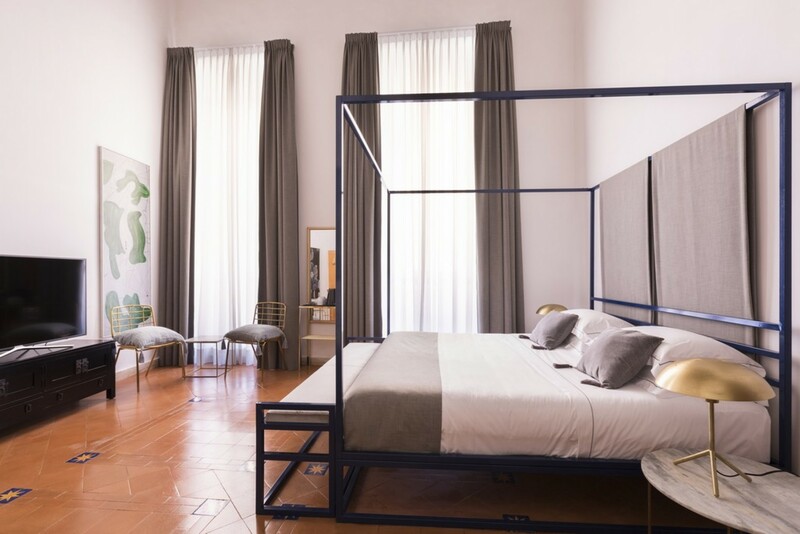 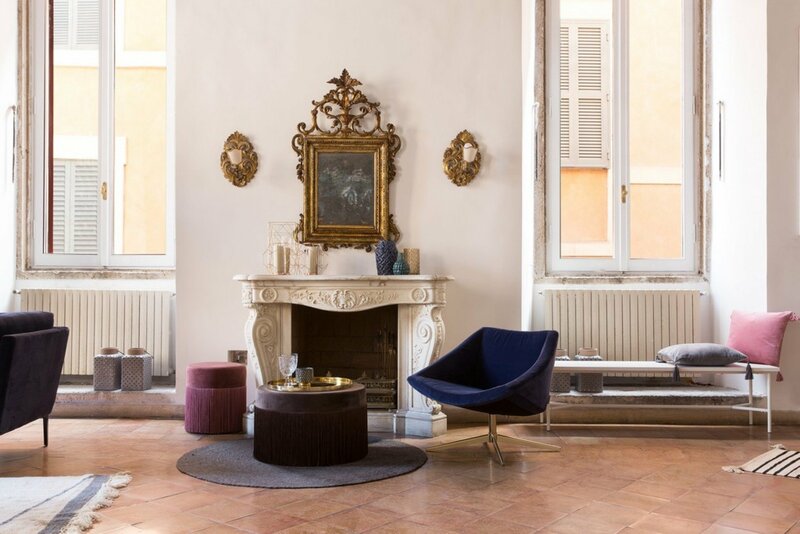 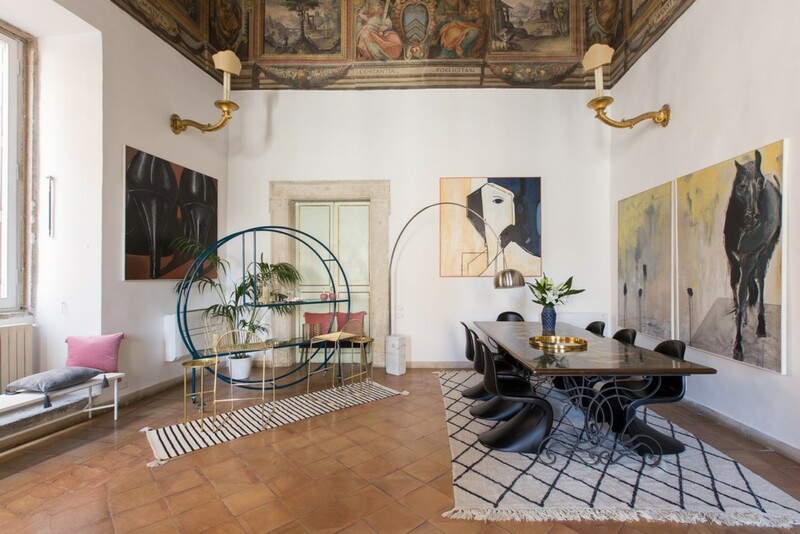 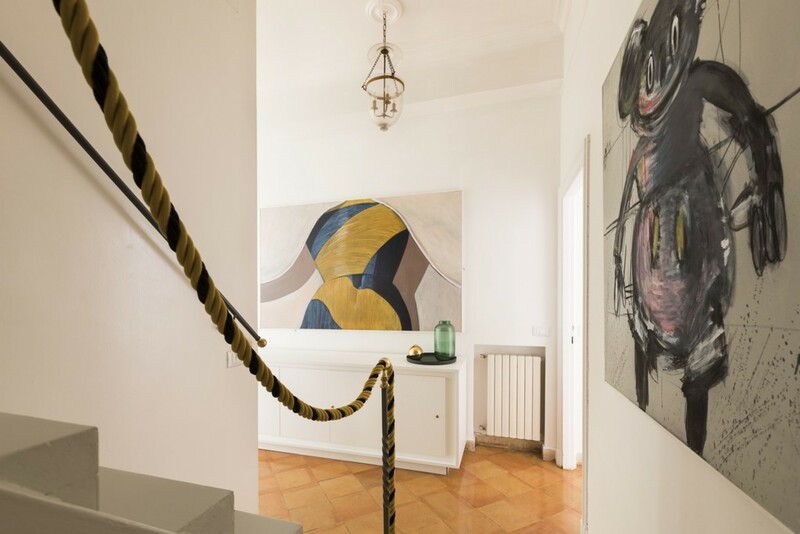 Residing within the Piazza Mattei of Rome, Costaguti is ideally placed to be within walking distance of many of Rome’s monuments that enjoy their world-famous status to the fullest. 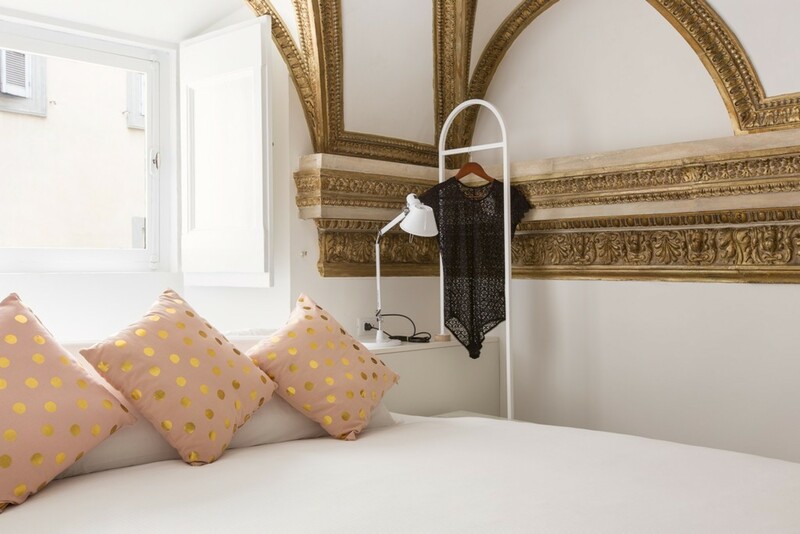 Teeming with a rich history and wondrous buildings that act as the markers of their time dotted across the city, the phrase “all roads lead to Rome” stands true. 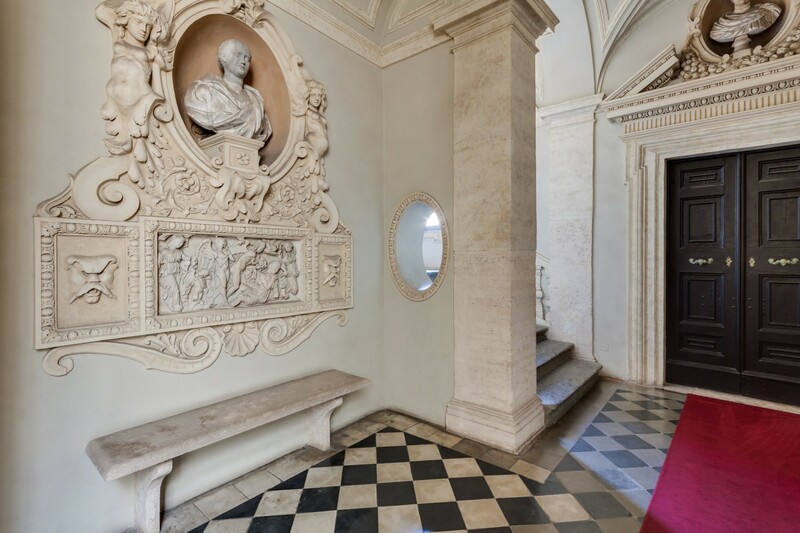 At the very heart of Rome itself, Costaguti has stood for many centuries, a building of its time and filled with many Renaissance-era pieces. 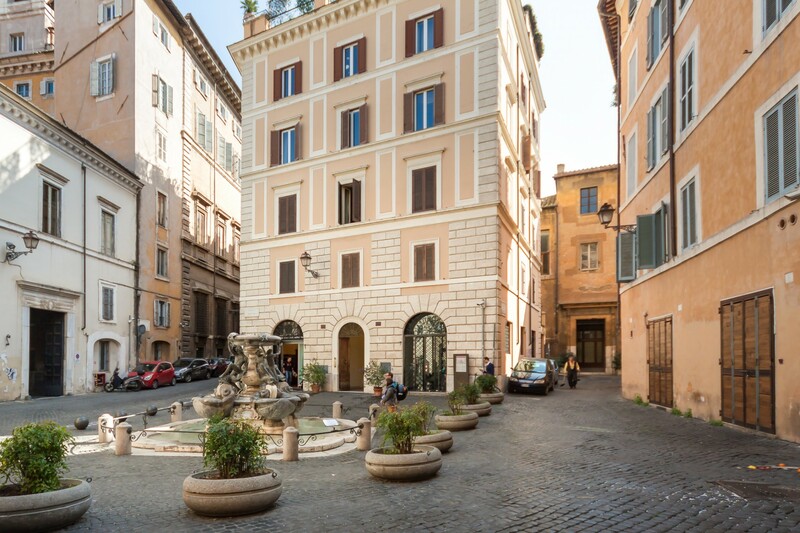 Overlooking the Piazza Mattei and the exemplary Turtle Fountain, the splendour of the city greets you as you step from the front door. 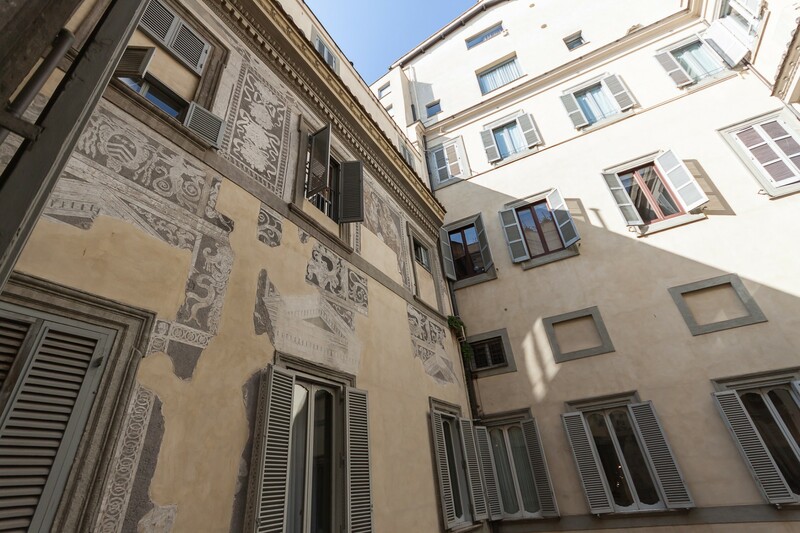 Chock full of centuries-old sights to set your gaze upon, shops of endless variety awaiting your custom and restaurants aplenty for guests wishing to experience true Roman cuisine, explore the city at your own pace and whim, or see the best of everything with the experienced steps of a trusted tour guide. 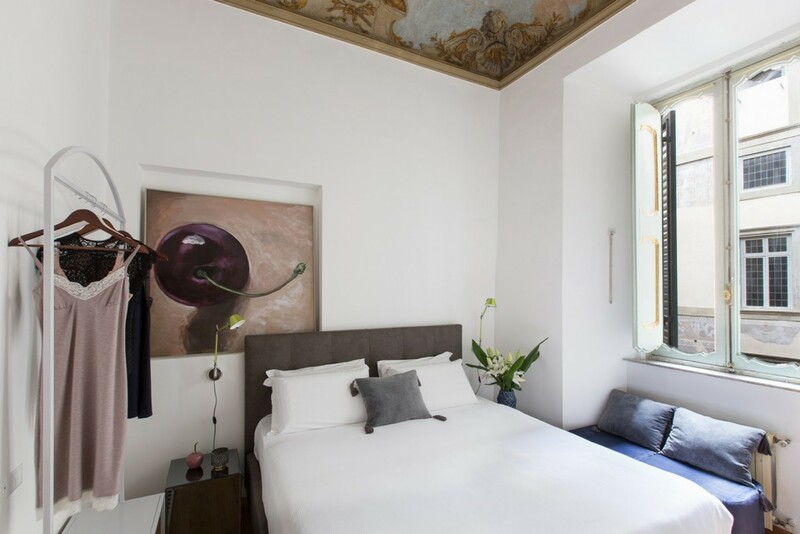 In either case, a wealth of attractions is in plentiful supply for visiting, and guests will find themselves enraptured as they travel through the enchanting Eternal City.